Gamajet offers specialized jet cleaning product and engineering solutions, based on its key technologies of heat transfer, separation and fluid handling. Every device is custom selected for optimal cleaning and provides a solution for every tank, tote and vessel, regardless of shape, size or internal obstructions. Their products use patented technology to save companies billions of gallons of water and chemicals, millions of hours, and facilitate massive increases in plant productivity and worker safety, all over the world. Gamajet Power Flex Large Tank Wine Cleaning Nozzle. The Gamajet range of wine tank cleaning machines are specifically engineered to offer the most efficient and effective cleaning for storage tanks with capacities ranging from 20,000 to 1,000.000 litres. 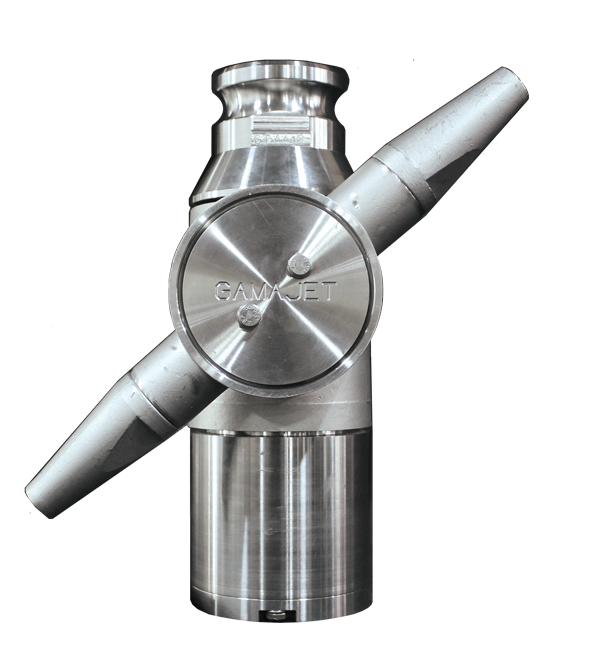 The durable machines offer optimal cleaning at a variety of pressures and flows. The standard machine is self-cleaning, self-flushing, and self-lubricating, requiring no oil or grease in the gear train. The key to the Gamajet range of tank cleaning machines is versatility and durability is the use of an oversized gear head that efficiently generates the proper torque to rotate the unit. The larger components last 20-30% longer than traditional drive mechanisms, making the Gamajet machines robust and durable. 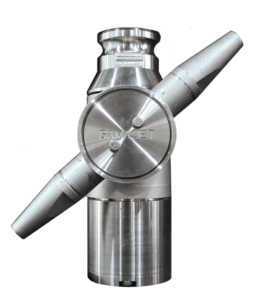 The large gear reduction allows the Gamajet to operate at lower pressures and higher flows when compared to other tank cleaning machines and uses the same proven Gamajet impingement cleaning pattern, scouring 100% of the tank, every time. Owner/winemaker Mike Conway of Latah Creek Winery, Spokane, WA, has been practicing his winemaking art for 30 years, and during that time he has used at least six different tank cleaning machines, from spray balls, to inferior rotary impingement machines, and finally the Gamajet. Prior to purchasing the Gamajet, Mike was consistently dissatisfied with the cleaning of his stainless steel tanks, ranging from 1200-5000 gallons, up to 12 feet high, and 6.5 – 9.5 feet in diameter. The spray balls were inefficient and time-consuming, often taking 2 -3 hours to clean each tank. The other impingement machines kept breaking down and the manufacturers were not responsive to the problems Mike was facing with their machines. Finally, Mike received a marketing piece from Gamajet that peaked his interest, so he gave them a call.